In as soon as six hours it is possible to remove from Google top ranking derogatory search results of your name or business. The black hat CTR tactic discussed in CHAPTER 3 is one of the most powerful, little known, yet inexpensive SEO secrets to take back your good name from Google search.Creating duplicate content (without your derogatory mentions) with superior backlinking authority to automatically penalize the ranking webpage result of your detractors is another legal, yet unauthorized Google SEO means to prohibit injurious results from ranking. This tactic takes a matter of weeks and is explained in Part II. You can also achieve total control of your own first page of search results with purely “white hat” tactics – SEO efforts agreeable to Google. White hat tactics involve building out authoritative web results that you own or control using higher ranking authority criteria than the ranking webpage(s) that are currently damaging your reputation.Paramount to ranking your own web properties is creating a superior backlinking profile that includes more backlinking domains and higher authority backlinks than your competition that has temporarily taken over a first impression of your online reputation.A superior backlinking profile is achieved through three strategies discussed in detail in PART IV of this book: (1) “kamehameha” link chi - the legal, white hat draining of authoritative link chi from very high authority websites, to your own web properties; (2) SEO made simple is just buying cheap expiring websites at auction before they drop with high authority backlinks and rebuilding them anonymously with topically relevant high authority link chi to your own web properties; and (3) the small business SEO standard of creating a superior number domains backlinking to your web properties than the number of domains backlinking to the webpage result that you are about to banish from Google’s search results using a diversity of anchor text (clickable text). 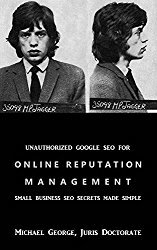 White hat tactics may take longer – by a factor of months - but will be just as effective and long lasting Google SEO.I teach my clients, and now my readers, my most effective white and black hat methods, and let you decide how you want to proceed in affecting the protection and control of your own online reputation management. Fair or not, your name or business is soon Googled by every serious prospect, client, competitor, or potential date. However, less than four percent (4%) will ever have a look beyond the first page of results. And for all intents and purposes nobody’s looking past the middle of second page search results at all.So, a government agency, a pissed off client, the ex, a news story, or any busy body with an embarrassing ax to grind too often makes it to the first page of Google when your name or business is searched.Human nature being what it is, people are more interested in vice than virtue, so the negative stories become more popular and, therefore, achieve higher and higher ranking, leaving an unfair, unbalanced, damaging, and lasting first impression of you or your business on your world at large.Just how much lost opportunity negative first page results are depriving you will never be known. In the Age of Technology successful people must take control of how they are portrayed online. Fortunately, controlling what information results from a search of you or your business is matter of specialized knowledge and resources: the knowledge of the controlling factors that Google automatically relies on to rank each result for your name or business, and the specialized resources that will determine webpage ranking.These ranking factors I teach in this book. It is only a matter of marshaling enough of these resources to displace your detractors and take back your online reputation management through cutting-edge, world-class Google SEO secrets.